If this series had a motto—or perhaps, better stated, an unbreakable rule—it would be: “One cat, one time”. Each furball is profiled once. The problem: Sometimes there is uncertainty, and occasionally I will chance repeats. Hanoi and Bell may be one in the same, although I put the odds of not at 70-30. I am less confident about Betty and Betty Too or Stalker and Twilight. Odds are more like fifty-fifty, with proximity of sightings majorly causing uncertainty. In preparing this post, and reexamining photos, I see a common curvature to the two Bettys’ tails that increases the likelihood of a goof. That introduction brings us to Laramie (his real name) and my big question: Is he the same feline as the one nicknamed Spry, whom my wife and I observed in the alley behind Alabama on June 13, 2017? 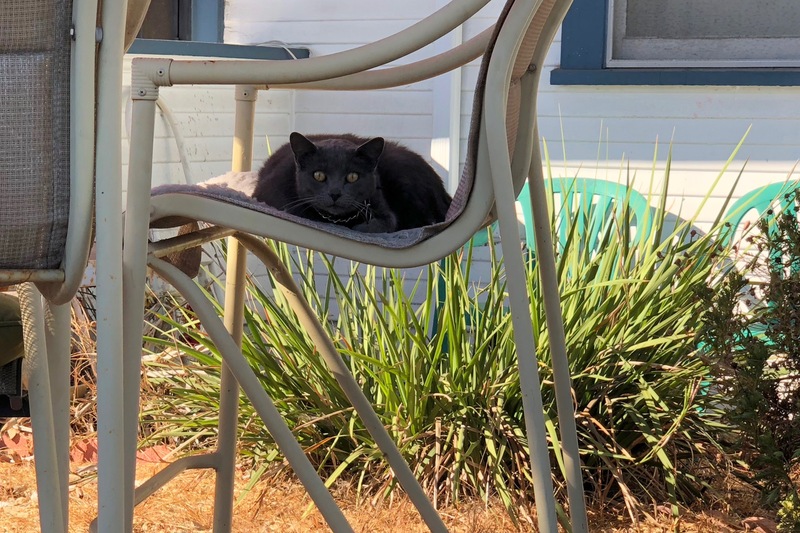 Out on the street-side of the same block, where also Smokey and Monkey live, resides another ravishing grey; his housemate will be the next kitty to join the series. The cats were seen so close, could be. Then again, if not for Amanda‘s collar, she and Smokey could be confused, too, and I have seen both within a block of either. Over several days, I repeatedly examined all photos taken of Laramie and Spry, and similarities only matter because of proximity to their sightings. So I take the chance. The Featured Image is a dramatic close-crop from an original shot with iPhone X on Nov. 18, 2017 at 9:21 a.m. PST—right, more than a month ago. 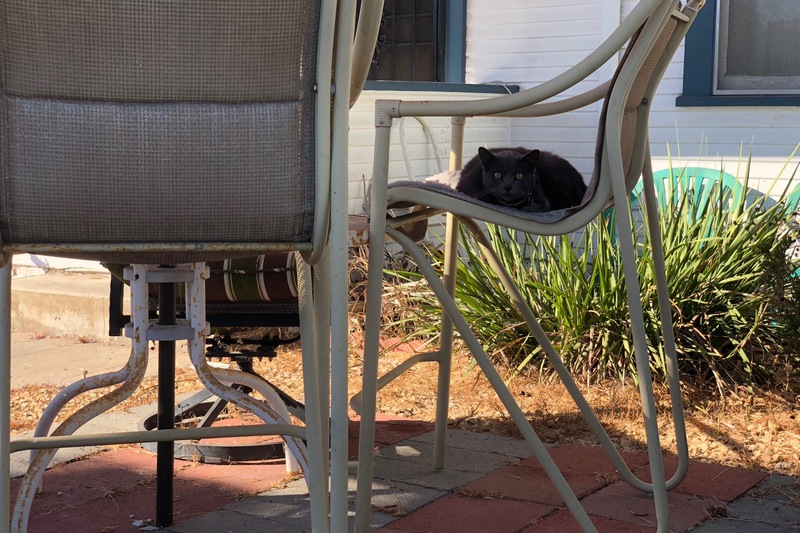 I waited weeks to meet the owner and to ask the cat’s name and that of his companion, who sometimes sits on the same chair or another around an outdoor table. Vitals: f/2.4, ISO 16, 1/261 sec, 6mm. The other photo is an original captured as composed, except for slight straightening. Vitals are same except for shutter speed of 1/269 sec. Update Feb. 17, 2019: Laramie’s and Lupe’s owner moved to Tucson, Arizona. He abandoned the cats. Someone else will be staying in the rental house for a few weeks and feeding the cats. But beyond that is uncertainty. Local non-kill shelters have long waiting lists, and the owner thought best to leave the animals for now rather than risk them being euthanized. Give a pat to: Scruffy, Roly Poly, Woo, Skull, Biscuit, The Colonel, White, Chipper, Frisky, Stretch, Needy, Farfisa, Mates, Hunter, Pee-Pee, Blue, Blue Too, Bonded Pair, Patience, Fess, Jumper, Frenemy, Looker, Cozy, Scout, Lurks, Skit, Mini, Betty, Black and White, Stalker, Bell, Chill, Sammy, Scratch, Poser, Star, Grey and White, Watcher, Herman, Comet, Roman, Willow, Chub, Nimbus, Watson, Lilo, Kit, Pepe, Twilight, Sebastian, Spot, Booger, Ash, Veruca, Riley, Mellow, Bonde, Flower, Glass, Black, BeBe, Fang, Bruce, Siamese, Pounce, Tortie, Haiku, Fraidy, Peso, Daniel Tiger, Dusk, Stride, Dainty, Spry, Tabby, Betty Too, Still, Levi, Shadow, Sophie, Wink, Ferals, Momma, Charlie, Tux, Cool, Benny, Jellicle, Itchy Valentino, Goldie, Nine, Amanda, Siesta, ChaCho, Charlie, Too, Mika, Crystal, Seeker, Mittens, Dancer, Smokey, Monkey, Captain Blackbeard, Season, Maven, Tink, Chunk, Curious, Hanoi, Bella, Tarry, Guido, Maxine, Mr. Kitty, Peohe, Panda, Frankie, Sunshine, Twain, Willow, Too, Brawn, Reddy, and Burglar.